One of RD Burman's most famous soundtracks, containing the quintessential Bollywood cabaret number 'Piya Tu Ab To Aja', sung by Asha Bhosle and performed on screen by the incomparable Helen. Song and scene both are awesome; elaborately arranged and staged, catchy, full of subtle (and not so subtle) eroticism - a classic. And a lot of you will know it already. The question is then, how's the rest of 'Caravan'? Well, not all that exciting to be honest. Most of it is traditional, and unmemorable (and no, I'm not equating those two things). Both 'Ham To Hain Rahi Dil Ke' and 'Daiya Yeh Main Kahan Phasi' have their moments, but the only other track that's really worth mentioning is the lovely 'Ab To Mile Hai'. My kind of campfire singing. To celebrate the new decade, I'm throwing in a Burman bonus. Happy new year! Thanks for Pantera, great newspaper article, where did you find that ! I was actually hoping to link it to a film review; I think you mentioned in a comment over at yours that you might be doing one...? Great start for the year. Thanks PC. I can't Thank you enough !. I was waiting for this one. IMHO, the kind of music and songs that RD put into this one album alone, was rarely matched by him elsewhere. 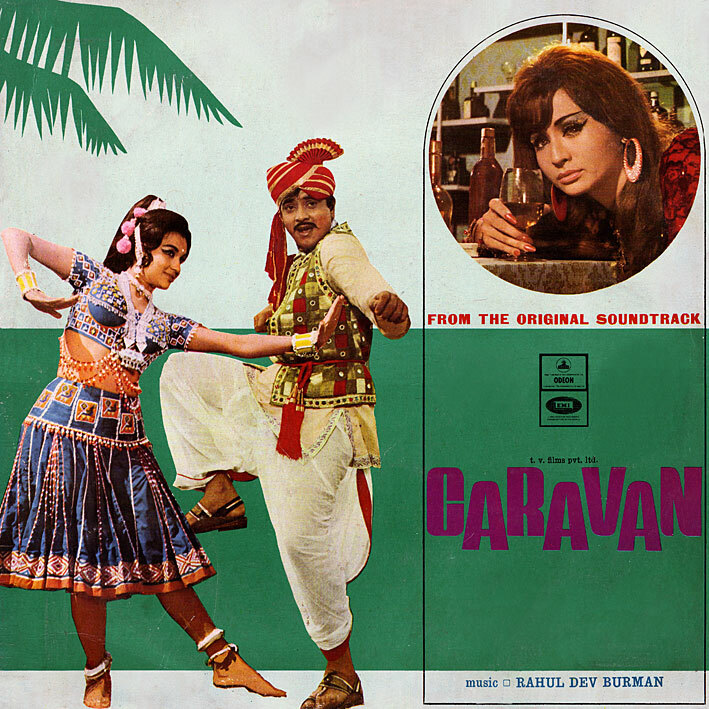 For Nasir Husain (Producer), he always produced something extraordinary and Caravan is no exception. A cult album, and definitely one of RD's Top 10 (of all time). Thanks so much, and Happy New Year !!!. P.S: I see there are some awesome albums lined up. Great ! Pantera & Caravan ! Total Burman-ish start for a new year. That '80s Pantera sleeve is awful !! Happy New Year PC. Thanks a ton once again for this fantastic album. I believe Dilbar Dil Se and Chadti Jawani are immensely popular numbers as well. Don't have it I'm afraid. Ha Caravane i liked very much the famous song. I had a real pleasure to see Mukkadar Ka Sikkandar. Did you sau it? Perhaps you recognised the jacket of my radio program. I mixed two jacket of your vinyls. I made a party and i couldn't imagine but everybody danced on Bollywood twist. Jan Pehechan Ho from Gunam had a lot of succes. I always thought nearly all of Caravan was amazing. Especially "Dilber Dil Se Piyere" and "Kitna Piyara Wada"
Thanks. That happened quite a lot though, them omitting the (often ace) title music from the soundtracks. Well done, Mister Naidu !! That's clearly Usha Iyer's voice. Yw. Glad u you guys liked it! So, that's Usha Iyer aka Usha Uthup's voice on the tile music? Thanks for the info, litlgrey. She also did the vocal of one of my all time favorites - Ek Do Cha Cha Cha from Shalimar. I don't think Uthup work with many other music directors other than Burman. Of course, she has a website... I imagine you could simply ask her. She sang for Bappi on Disco Dancer, and on KA's Purab Aur Pachhim. DId she? Ah, thank you! I have this theory, but not being either Indian or Indian-American, I can't prove it - perhaps some of those readers of this blog will feel free to ring in - but I am thinking that Iyer's comparatively western sounding deep voice and her nearly unaccented American english limited her appeal in Bollywood circles. Is there anything to that, or am I making it up? I wouldn't know myself... just read her wikipedia entry though; nothing there to suggest the above. Other than the front covers, which are included in the download files, I haven't really got the time to scan more of the artwork. It would take me too long to include back covers, gatefold insides, labels etc. Sorry. yah........its ok....but if u get any chance, please share them with me...thanks again..